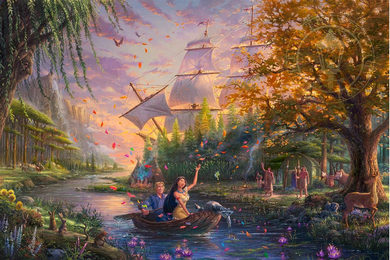 Thomas Kinkade Limited Edition Giclee Print / Hand Embellished Canvas:"Pocahontas Colors of Love"
Sizes: 12" x 18" | 18" x 27" | 24" x 36" | 28" x 42"
About the Art As the evening sun retreats beyond the ship, Susan Constant, and the horizon, a new love is forming between two distant worlds. The artists at Thomas Kinkade Studios have brilliantly captured one of Disney's most successful box office hits in one scene entitled, Pocahontas Colors of Love. Immersed in traditional Kinkadian light, seen reflecting off the water and illuminating the entire scene, many of the animated characters from the movie, both heroes, and villains, are scattered throughout this narrative panorama. Pocahontas is a story about a free-spirited woman who fights for true love although she has everything working against her, and is a reminder that the color of love conquers all.